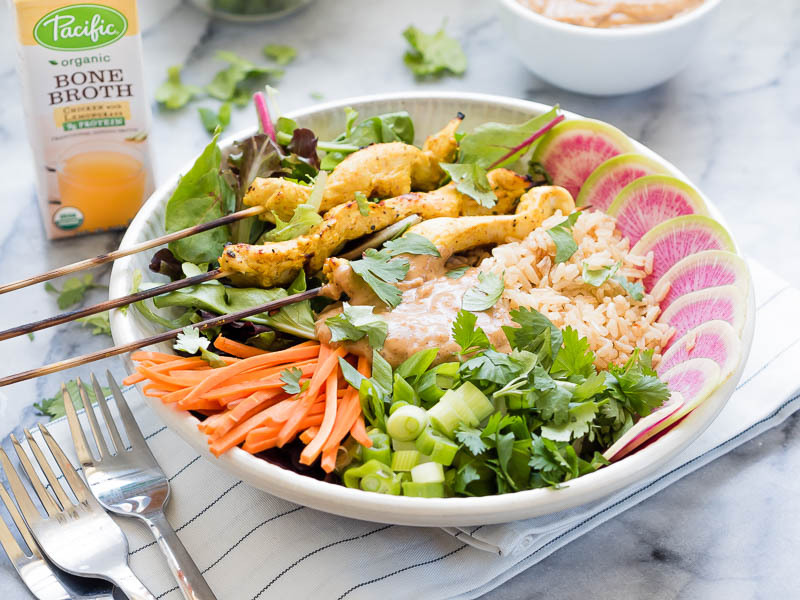 This lemongrass chicken satay bowl is made up of grilled chicken, tons of veggies, rice cooked in Pacific Foods Organic Chicken with Lemongrass Bone Broth, peanut sauce, and ALL THE FLAVORS! I’ve been eating this for a few days now (yassss leftovers) in two forms: as the bowl (as pictured), and as a wrap (just add tortilla!). I’m into it!! Let’s do a (very) brief life update while we’re here, ok?! Since the last time we talked (hi sorry it’s been so long) I gave my two weeks at work, accepted a new job, started 3 weeks of funemployment, and have now lounged around being waaaaay less productive than planned for about a week and a half. More than halfway down with my funemployment and STILL SO MUCH MORE TO DO! I’m trying accept that it’s okay to chill out between jobs, and that I don’t need to always be productive (b/c I really am not being productive). Taking a break is okay! I think? 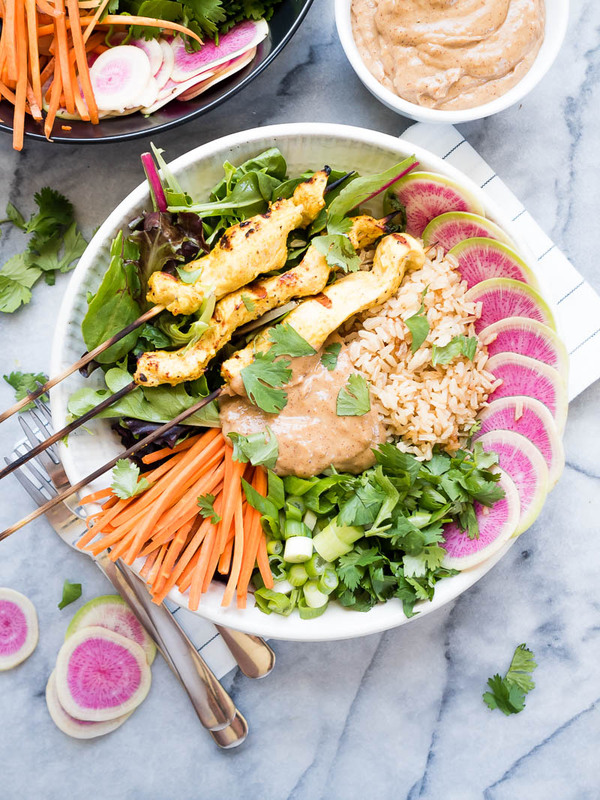 This lemongrass chicken satay bowl has rice cooked in lemongrass chicken broth, a lot of veggies, herbs, and peanut sauce. It’s a fresh, healthy meal that comes together with minimal effort! Prepare the marinade by combining all of the marinade ingredients. Set aside. Slice the chicken breasts lengthwise into thin (less than 1″ thick) strips. Put in a ziplock bag and then pour in the marinade. With your hands, work the marinade around all of the chicken, then remove all of the air, seal, and refrigerate for at least 2 hours. While the chicken is marinading, prep all of the veggies (cut them up!) and make the peanut sauce. Rinse the rice with water, then cook in the Pacific Foods Organic Bone Broth — Chicken with Lemongrass. When you’re ready to cook the chicken, weave a skewer through each strip of chicken, then grill until cooked all the way through. 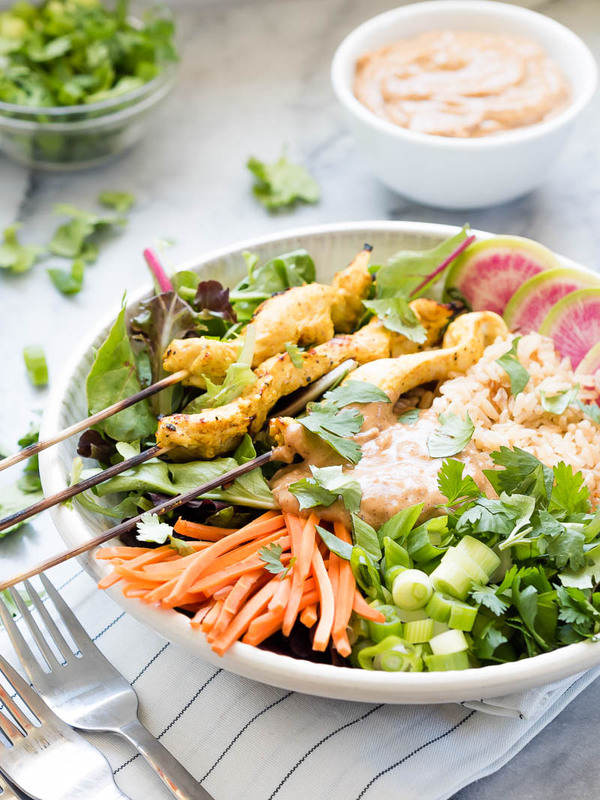 To assemble the bowls, combine your preferred proportion of each: rice, mixed greens, chicken, sliced vegetables, and peanut sauce. 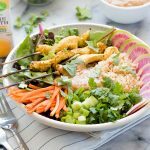 Mix together, using the peanut sauce as a dressing, and enjoy!